GOT A PARTY, NEED A BAND? Impress your staff, friends and families with the hottest party band in town & the superb musicianship that is ‘Sugar Rush’. Book now, and guarantee your guests a great time! 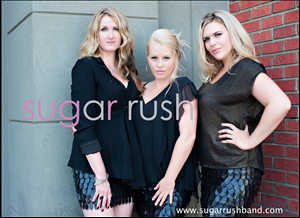 A group of talented musicians, ‘Sugar Rush’ is your finest option for your party this season. Each with extensive recording, touring and performing resumes, these highly trained professional musicians have the experience and skill to play all genres of music and are guaranteed to bring you an amazing show. Fronted by three very soulful ladies, Johanna Sillanpaa, Lyndsey Hoff & Kathy Shane, this sweet and savory group of 7 bring the new and the classic top 40 hits to life on stage with a high-energy and fun-filled show that is guaranteed keep you dancing all night long. every event is unique and encourage clients be as hands on as they want in the repertoire selection and will do anything they can to make your event a success. Sugar Rush can cover all your entertainment needs, whether it’s a wedding with several musical configurations throughout the event or a straight up dance party. Call us and we are happy to discuss your options.